Czar Paul I of Russia: the first pseudo-Romanov? It’s possible Russia’s 19th and 20th Century czars didn’t really belong to the imperial family. They were called Romanovs, members of the dynasty that had built the Russian Empire, but for some the name rang false. The last undoubted Romanov, Czar Peter III, married a German princess in 1745. History remembers her as Catherine the Great. History also remembers Catherine’s extramarital affairs. The czar was sexually uninterested or even incapable, so Catherine enjoyed serial monogamy with a long list of lovers, starting with an officer named Sergei Saltykov. In her memoirs, she suggested that Saltykov fathered Paul I, the next czar, and some historians believe her. 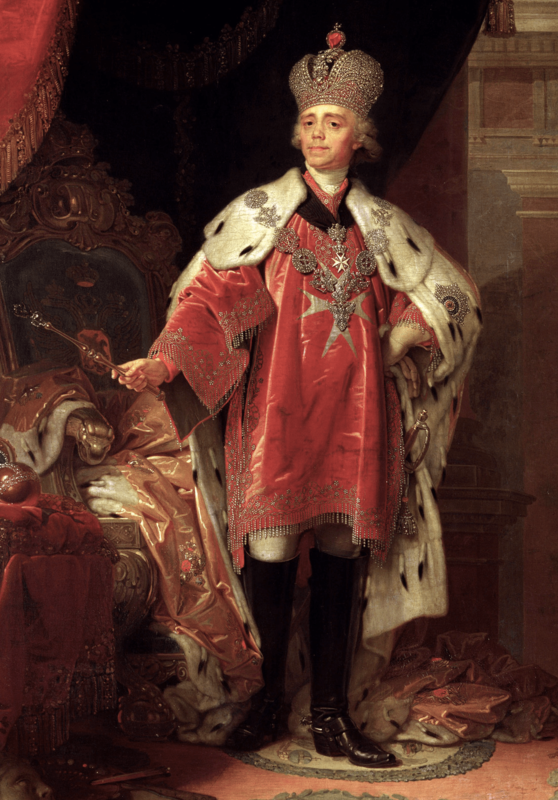 Paul inherited the throne in 1796 — from Catherine, who’d seized it from her husband — and the remaining czars descended from him. If Saltykov fathered Paul, none of them was a Romanov. Nobody left to do DNA testing on….? Good question, Laura! We’ve got DNA for the latter-day (questionable) Romanovs, but so far as I know, none for the originals (Peter the Great, Peter III, and the other undoubted members of the family). I love your blog I learn so much!